This figure shows how a company's data network has been modified to allow calls to pass through it. In this example, a call server in Chicago receives registrations and call requests from users connected to the company network in Chicago. When a caller dials the telephone number for a co-worker in the Atlanta office, the call request is first sent to the call server in Chicago. The call server uses the dialed digits to look up the data network address of the call recipient in Atlanta. The call server then and sends this destination network address back to the caller's IP telephone. The IP telephone can then directly communicate with the caller in Atlanta directly through the data network. If the caller in Chicago dials a number that is not on the company's network, the call server can instruct the IP telephone to use a voice gateway to allow the call to be completed through the public telephone network. 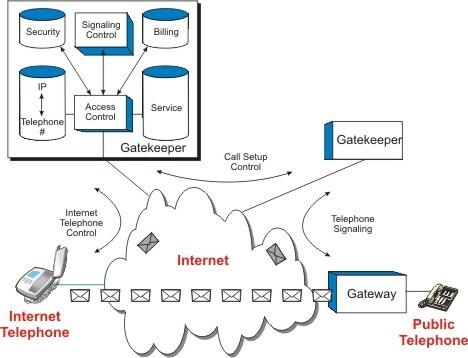 This figure shows how a gatekeeper sets up connections between Internet telephones and telephone gateways. The gatekeeper receives registration messages from an Internet telephone when it is first connected to the Internet. This registration message indicates the current Internet address (IP address) of the Internet telephone. When the Internet telephone desires to make a call, it sends a message to the ITSP that includes the destination telephone number it wants to talk to. The ITSP reviews the destination telephone number with a list of authorized gateways. This list identifies to the ITSP one or more gateways that are located near the destination number and that can deliver the call. The ITSP sends a setup message to the gateway that includes the destination telephone number, the parameters of the call (bandwidth and type of speech compression), along with the current Internet address of the calling Internet telephone. The gatekeeper then sends the address of the destination gateway to the calling Internet telephone. The Internet telephone then can send packets directly to the gateway and the gateway initiates a local call to the destination telephone. If the destination telephone answers, two audio paths between the gateway and the Internet telephone are created. One for each direction and the call operates as a telephone call. This figure shows how echoes can be removed. 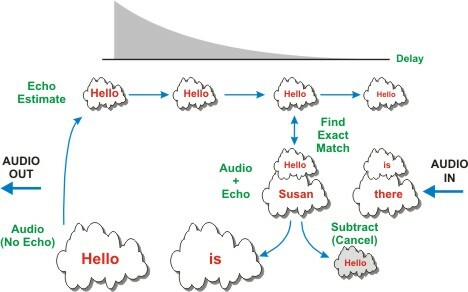 In this example, the transmission of the words: "Hello, is Susan there" experience the effects of echo. When the signal is supplied to an echo canceller (a sophisticated estimating and subtraction machine), the echo canceling device takes a sample of the initial audio and tries to find echo matches of the input audio at delayed periods (the amount of echo time). In this example, it does this by creating various delayed versions the audio signal and different (reduced) amplitude (echo volume usually decreases as time increases), and comparing the estimate the audio that contains the echo. When it finds an exact match at a specific audio level, the echo canceller can subtract the echo signal. This produces audio without the echo. Mr. Harte has over 29 years of experience in the electronics industry including company leadership, product management, development, marketing, design, and testing of telecommunications (cellular), radar, and microwave systems. He has been issued patents relating to cellular technology. He has authored over 75 articles on related subjects and has been a speaker and panel moderator at industry trade events. Mr. Harte earned executive MBA at Wake Forest University and received his Bachelors degree from University of the State of New York. During the TDMA digital cellular standard development process, Mr. Harte served as an editor and voting company representative for the Telecommunications Industries Association (TIA) TR45.3, digital cellular standards committee. As of 2003, Mr. Harte had authored and co-authored over 20 books relating to telecommunications technology. He has served as a consultant and expert witness for leading companies including Ericsson, Siemens, VLSI, AMD, Casio, Samsung, Sony, ATT, Nokia, Hughes and many others. This “Introduction to IP Telephony” book explains why companies are converting some or all of their telephone systems from dedicated telephone systems (such as PBX) to more standard IP telephony systems. These conversions allow for telephone bill cost reduction, increased ability to control telephone services, and the addition of new telephone information services. By upgrading their systems, companies can immediately reduce their telecommunication costs 40% to 70%. Because IP telephony systems allow the end user and system administrators to setup and disconnect telephone numbers and services, this provides increased control over their telephone features and services. IP telephony is usually based on standard data formats (Internet Protocol). This permits information systems (such as product catalog information) to be more easily linked to the telephone system, thus providing the ability for companies to increase sales through interactive telephone and Internet order processing systems. You will learn that not all voice over data IP telephony systems and services are the same. There are cost and quality tradeoffs along with common problem areas and risks. There are many ways these systems can reduce telecommunication costs along with the ability to create new revenue producing services. You will understand how you can get better than telephone toll quality audio, how to maintain or increase system reliability, and new ways to use intelligent telephone systems to increase company revenues. You will learn how employees can keep their phone numbers and existing equipment (using adapters) and call anywhere in the world using IP telephony services. Discover how you can get one (or several) international telephone numbers so your customers can use a local telephone number to call you when you are in another country.